It’s July and the birthstone for this month is the lovely Ruby! What is a ruby and how did it get it’s color? ~ A ruby is a pink to blood-red colored gemstone, a variety of the mineral corundum. The red color is caused mainly by the presence of the element chromium. Its name comes from ruber, Latin for red. Corundum is the second hardest mineral, after the Diamond. It comes in a variety of colors, and is considered a Sapphire in any color, except red, which is designated as the Ruby. Rubies range in hue from an orange-red, to a purple-red, but the most valuable gems are a true red in color. Larger sized Rubies are very rare. Generally, gemstone-quality corundum in all shades of red, including pink, are called rubies.However, in the United States, a minimum color saturation must be met to be called a ruby, otherwise the stone will be called a pink sapphire. Color of the Ruby and how it affects value ~ Diamonds are graded using criteria that have become known as the four Cs, namely color, cut, clarity and carat weight. Similarly natural rubies can be evaluated using the four Cs together with their size and geographic origin. In the evaluation of colored gemstones, color is the single most important factor. Color divides into three components; hue, saturation and tone. Hue refers to “color” as we normally use the term. Transparent gemstones occur in the following primary hues: red, orange, yellow, green, blue, violet. These are known as pure spectral hues. In nature there are rarely pure hues so when speaking of the hue of a gemstone we speak of primary and secondary and sometimes tertiary hues. In ruby the primary hue must be red. All other hues of the gem species corundum are called sapphire. Ruby may exhibit a range of secondary hues. Orange, purple, violet and pink are possible. Interesting facts about the Ruby ~ It has been said that the Ruby’s red glow comes from an internal flame, making a gift to someone with this stone, symbolic of everlasting love. It is very durable, so it makes a perfect engagement gem. If worn on the left hand, ancient folk lore says that the Ruby will bring you good luck! What are the largest Rubies in the world? 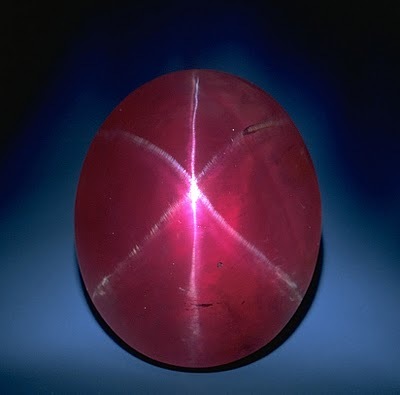 ~ The Smithsonian Museum in Washington, D.C. is home to the “Rosser Reeves Star Ruby,” a 138.7-carat stone. The “De Long Star Ruby”, is 100 carats but still impressive, and is at the American Museum of Natural History in New York City. The “Edwardes Ruby,” a 167-carat giant, is on exhibit in the British Museum of Natural History which is located in London. See our collection of Rubies at Jewelry Warehouse! This entry was posted in Jewelry, Pick of the Week and tagged jewelry warehouse, july birthstone, rubies, ruby. Bookmark the permalink.